Here at Christ Church we believe that ‘Affirming’ our faith - (af·firm –verb (used with object) 1. to state or assert positively; maintain as true 2. to confirm or ratify) is a significant part of our Journey with God. Affirmation can take shape in different ways, and so we are pleased that we can offer a ‘service of Affirmation’ that incorporates baptisms of teenagers or adults as well as giving the opportunity to affirm faith. Our Christ Church ’Family’ is from many different backgrounds, which gives us great diversity, and we want to reflect that diversity in the ways in which we offer opportunities for affirmation. We are an evangelical church that is part of the Church of England, which shapes aspects of what we do—in some cases this is dictated by the Church of England or the Diocese; in other situations we can have the freedom for a more ‘local expression’. Because of our wonderful diversity we offer choices that make room for a number of convictions including different methods of Baptism (e.g. of children by affusion (sprinkling) as well as of young people and adults when they make a profession of faith by full immersion), the opportunity to receive Holy Communion in appropriate circumstances as children and young people, and the encouragement to be Confirmed – recognizing that Christ Church is a part of the wider Church of England. This is not something to be rushed. Do you want to know more or discuss this? Public affirmation of your faith. What is it & Who is it for? Have you previously been baptised? Has God moved in your life in a significant way— have you returned to Faith? been filled with Holy Spirit? Been led by God into a new season of Adventure with Him? If so, then Publicly Affirming your faith might be a perfect way for you to share all that God has been doing with your Friends and Family here @ Christ Church. ‘Public Affirmation of Faith’ is a common practice for the Church of England, and allows for us to celebrate all that God is doing. If you would like to consider this please see one of the clergy. Please talk to the Vicar or office. 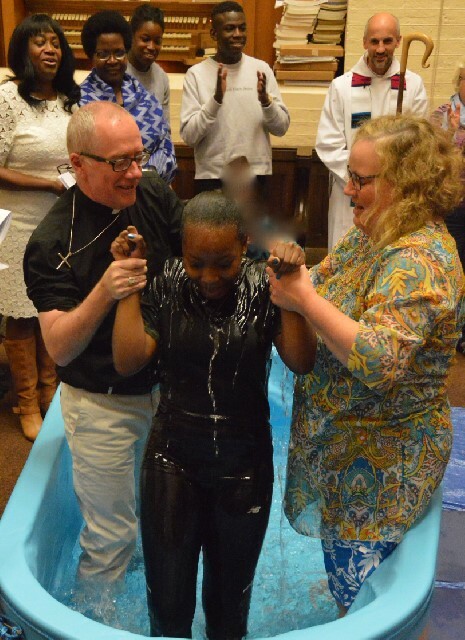 Baptism is a wonderful entry point into the Church of Jesus—When someone becomes a Christian, we are told in the Bible that we should be baptized as a part of our move into New Life with God. (The Church of England also allows children to be baptised by their parents, if they are going to be brought up within the church, and with the expectation that they will come to a personal faith in Christ for themselves). this is for you then. For those who would like to explore having their children Baptised or Dedicated, please contact the church office. You can be any age to be baptized, if you have become a Christian. In addition, and according to Anglican practice, children can be baptised if their parents intend to bring them up within the church and the Christian faith so that they come to a point where they make a profession of faith for themselves. What are the next steps? Further information? Attend the preparation sessions for children on Fridays and for adults on Thursday evenings. Christ Church had the joy of being one of the first Churches to begin allowing Children to take communion, alongside a process of learning and thinking about communion, and we are continuing to develop this aspect of worship for our Children and Young people. In order to start taking communion, you need to be baptised—see the ’baptism’ section for more info about that. We want to work together as a team of Parents, Youth & Children’s leaders and Church leaders to make sure that Children and Young people who have a living relationship with God can access Holy Communion. Children who believe in Jesus as their Saviour and have a relationship with Him, and are in or above school year 3 (i.e. 7/8 year old and above) from November 2011, may receive Holy Communion when accompanied by and under the supervision of a parent / guardian. Young people in school year 7 and above, who are actively involved in our youth ministry and who have become Christians may receive Holy Communion when accompanied by and under the supervision of a youth leader. There may be times—as with all of us—when a child should not receive Holy Communion for some reason. We would expect that parents would be aware of these situations, and help their Children to understand what it means to take Communion in a way that builds our relationship with God and enables us to live for Him. Enabling Children and Young People to receive Communion means that they do not have to wait until they are ‘Confirmed’ to do so. But we encourage young people in their mid to late teens to be Confirmed. Please see next section. If you are an adult, we would encourage you to be Confirmed – see the next section. Young people in our Youth Ministry who are baptised and have become Christians. Children in our Children’s Ministry who have been baptised and are in school year 3+ (i.e. 7/8 year olds and above). Please talk to the Vicar or Jude Barber. Return the Affirmation form to the Church Office. Attend the preparation sessions for children or youth. Confirmation is about our being ‘Confirmed’ by God and the Holy Spirit, or equipped, empowered and ‘commissioned’ as a Disciple or follower of Christ. It gives the opportunity to affirm your faith publicly. Confirmation is an adult and public profession of faith (declaring what has been said on our behalf if we were baptised as a child). It is a way of coming into full ‘recognition’ within a particular branch of the Christian church. Whilst Baptism brings us into the Christian Family (‘into Christ’, and His world wide Church), Confirmation brings us into full membership specifically within the Church of England. If you are member of Christ Church (as a part of the Church of England) then it might be appropriate to be Confirmed. When we’re confirmed, we’re commissioned as disciples of Christ (and we pray daily to be filled with His Holy Spirit). Confirmation recognises that we are a part of the wider Christian Church, and is normally conducted in one of the local Deanery churches and not necessarily at Christ Church. If you started receiving Holy Communion as a child or young person, we encourage you to be Confirmed in order to continue taking Communion as an adult. We offer and encourage young people from their mid-teens (i.e. 16 years old+, or perhaps post GCSE) and adults who are believing Christians to be Confirmed. If you are not Baptised, you will need to be Baptised. We expect those seeking Confirmation to be active members of the church and to have attended an Alpha Course (or similar) as well as the actual Confirmation preparation sessions. In your mid teens (i.e. 16 years old+, or perhaps post GCSE) and adults. Please talk to the Vicar. Attend the preparation sessions for adults and youth. Baptism is primarily a sign that God gives us rather than a symbol that we undergo for him. This means that we can only be baptised once. At Christ Church we believe that ‘Rebaptism’ cannot happen logically or theologically. This means that we believe that it should be expected that a baptised child is brought up within the Christian faith and church, taught and discipled so that they come to the point of making their own personal profession of faith, is filled with the Holy Spirit, etc. and means that, in our view, having been ‘baptised as a baby’ should not be the grounds for seeking reaffirmation of baptismal vows with water, as this is a natural and expected part of Christian development and growth. Affirmation or Confirmation are a more appropriate response – see above. Please talk to the Vicar or Church administrator. Has God moved in your life in a significant way? have you returned to Faith? been filled with Holy Spirit? Been led by God into a new season of adventure with Him? If so, there are opportunities to publicly affirm your faith at any stage within these options. This is simply a guide and we do understand that your experience may be different to this so please do contact the Vicar or Jude if you have any questions.